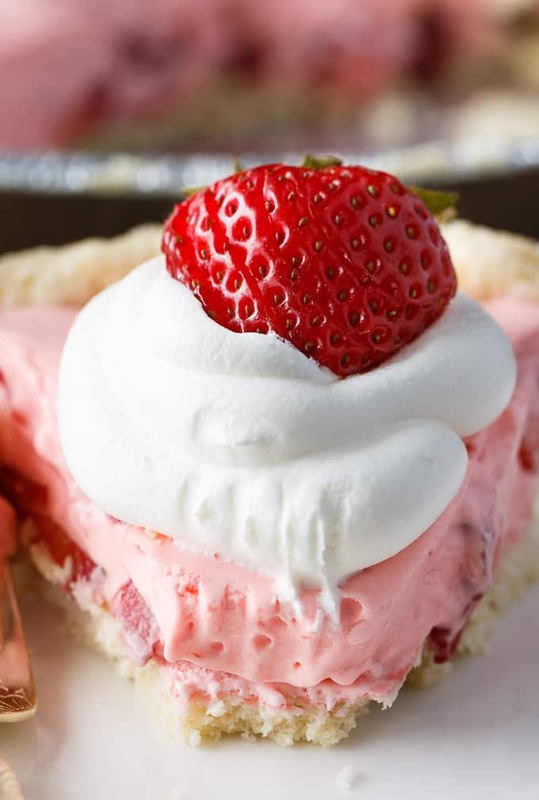 Oh Strawberry Cream Pie, how I love thee! Strawberries are EVERYWHERE in the summer months. You can find them at your local grocery stores (usually on sale), at Farmer’s Markets or even better, pick them yourself! I typically buy mine at the grocery store. I got two cartons the other day for $4. My kids eat strawberries like they are going out of style. I was amazed that I had any left for this recipe. Well, I did put a note on the package that said, “Don’t touch!”. Thankfully, they listened to me and I was able to make this luscious, dreamy Strawberry Cream Pie. Maybe it should be called Strawberry Dream Pie because it’s like a dream come true. It’s light, creamy, sweet and is like pure heaven in your mouth. 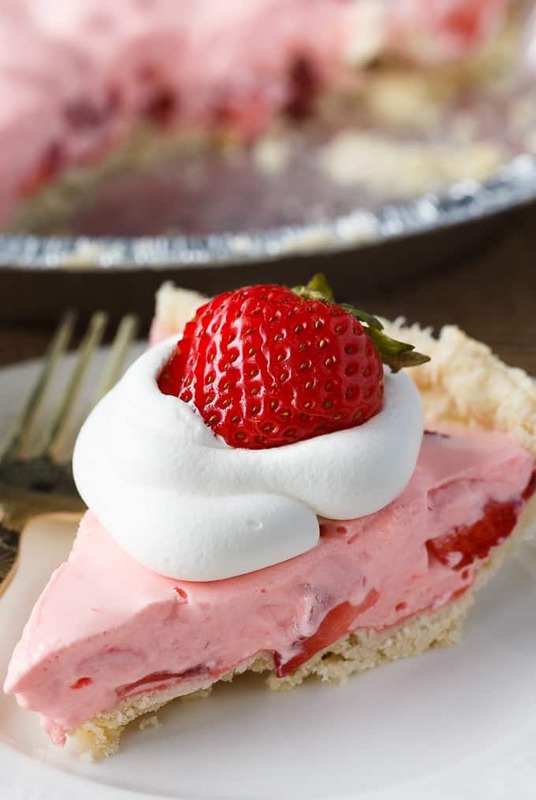 Strawberry lovers will go nuts over this easy pie recipe. Seriously, it’s soooo good. It’s not entirely no-bake though because you do have to cook the pie crust. I kept things simple and used a frozen pie shell that I could bake at home. I recommend buying the deep dish pie shell so you have more room for that heavenly strawberry filling. 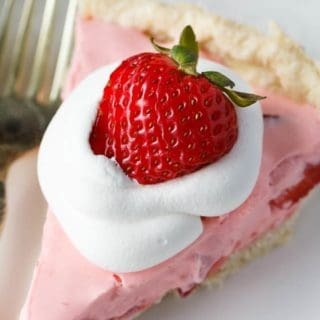 It has both strawberry Jello and vanilla pudding mix as well as loads of Cool Whip to give it that creamy texture. Sliced strawberries are mixed throughout. It may not be the healthiest dessert, but oh well. Indulge a little! It’s very simple to make this summer pie. 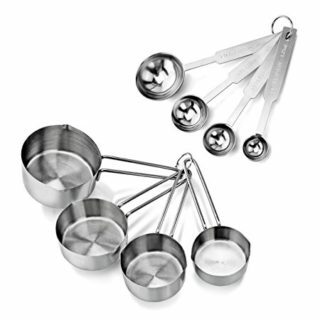 To start, add the Jello, vanilla pudding mix, water and lemon juice to a small saucepan over medium heat. Cook and stir until it comes to a boil and then remove from heat. Pour the mixture into a bowl and chill in the fridge until it thickens up. I let mine sit a couple hours. Once it’s ready, fold in Cool Whip and stir in the sliced strawberries. Pour the mixture into your prepared pie shell and chill in the fridge until set. I left mine overnight so we could enjoy it the next day. 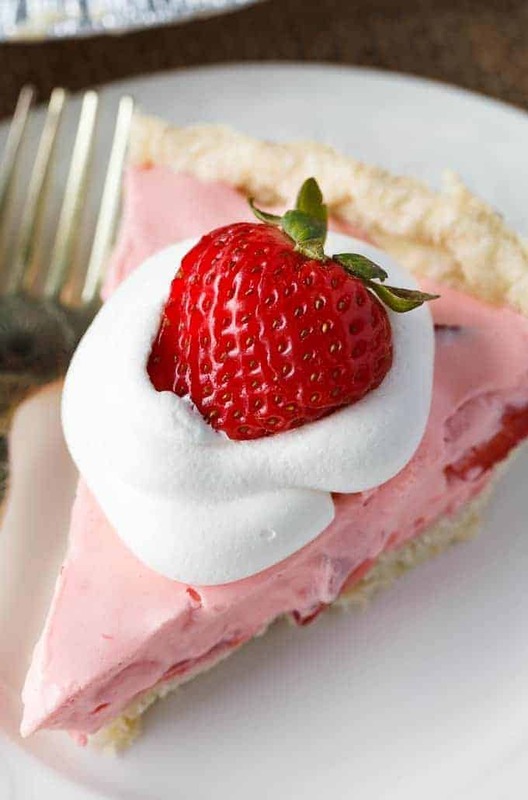 Garnish with a dollop of Cool Whip and more strawberries if you like! For more yummy strawberry recipes, try my Strawberries in the Snow, Strawberry Ice Cream and Strawberry Lemon Fool. You might also like this Sugar Pie. What are your favourite strawberry recipes? Tastes like a dream! 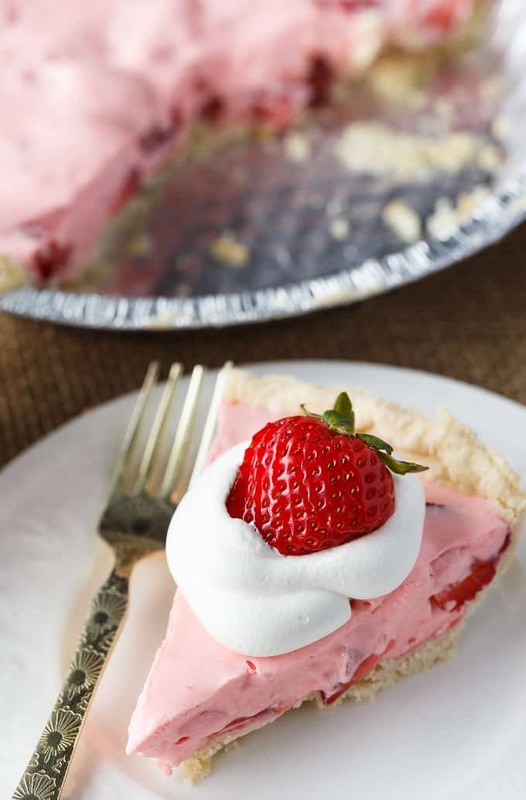 This easy summer pie is creamy, sweet and refreshing. 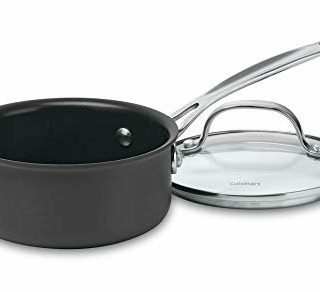 Combine Jello, vanilla pudding mix, water and lemon juice in a small saucepan over medium heat. Cook and stir until mixture comes to a boil. Remove from heat. Pour into a bowl and chill in the fridge until thickened. Once chilled and thickened, fold in Cool Whip, blending well. Stir in strawberries. Pour into pie shell and chill in the fridge until set. Garnish with strawberries and Cool Whip, if desired. What a great colour, this sounds so delicious! Would love to have a slice right now! Do you put the water in with the lemon juice? The recipe just says to put lemon juice with the jello and pie filling. This sounds so good and easy, can’t wait to make it! Gah! Yes, you do! Thank you so much for checking. This pie does sound like a dream! I love Strawberry and I like how simple this recipe is. Thank you for sharing at A Round Tuit. This looks amazing! 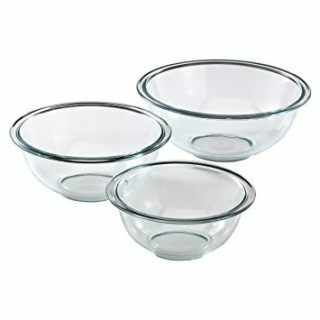 My mother-in-law makes a similar version, but she can’t eat much sugar, so she uses sugar-free versions of everything. Honestly, though, I stick with the sugar! I’m also looking for a cooked strawberry pie…don’t suppose you have a recipe for that? I love strawberry pie! I will have to try this one, looks so good and easy to make. brings back such great memories – thanks. YUM! I love strawberry anything! You can’t go wrong. This pie looks delicious. So perfect for summer… Thanks for the recipe! This looks delicious. 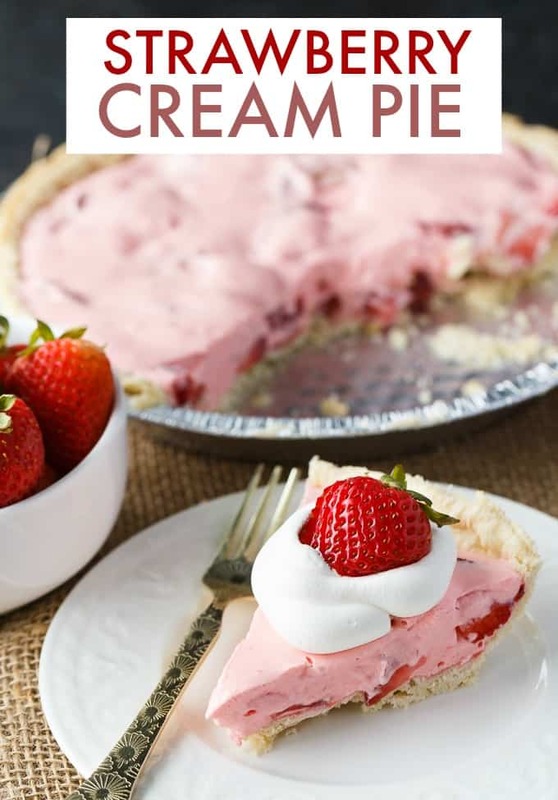 I’ve never tried making pie before but I’ll have to try this one for sure and strawberries happen to be in season right now . My fiancé will love it , thanks . 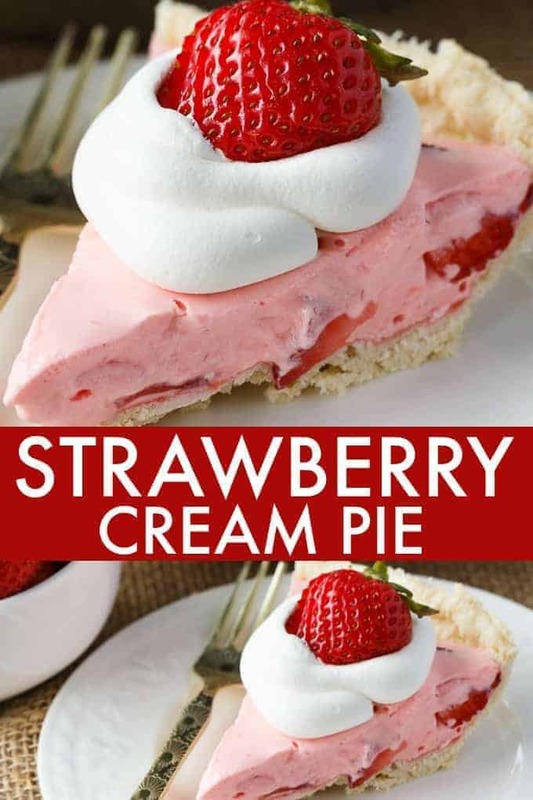 This is a lovely recipe for this time of year and I love strawberries….. gonna surprise my hubby with this one day this week. He’ll love it. yummy. It will be easy and tasty too!. Oh, that cream pie looks so delicious! It’s now on my gotta try it list! This looks delicious! My strawberries are ready to be picked, so now I know where I can use them! I really love strawberies but I like them all by themselves. No cream or nothing. Hubby on the other hand would love this pie. In fact he just bought a big package of strawberries so maybe I will make him a treat. Thanks for sharing. Oh my goodness! This pie looks amazing and delicious and beautiful! Thank you for the recipe. I’m assuming you use the cook and serve our filling and not the instant?? Wow, so delicious. And refreshing. Plus I love easy recipes like this. A perfect ending to our family bbq yesterday. Thank you for sharing. Oh yummy and so easy, a perfect choice combo!